Small and midsize companies in Korea will be given more funding support by the government for their research and development this year. According to the Small and Medium Business Administration yesterday, the government will spend 818.4 billion won ($779 million) in 2014 in the R&D sector for SMEs, up 1.8 percent, or 14.7 billion, compared to the previous year. The move is in line with the current administration’s focus on boosting a so-called creative economy and realizing “economic democratization” by nurturing SMEs. Not all SMEs, however, will benefit from the extended funding this year. The SMBA has categorized SMEs into different groups based on their performances and companies in each category are expected to receive different amounts of support after deliberation by the government. The government has decided to invest 11.7 trillion won ($10.4 billion) in research and development, of which 3.9 trillion won will be allocated to help realize the Park Geun-hye administration’s ambitious “creative economy” initiative. While the overall budget for R&D next year is a 2.2 percent increase from this year, the amount set aside for “creative economy” is up 5.9 percent. Even within the creative economy budget, the government has allocated 1.1 trillion won to not only support the competitiveness of start-ups and small and midsize companies, but also develop information communication technology and software convergence. That is nearly 27 percent more than this year’s budget. Additionally, the budget for public safety research and development, such as protection of personal information, as well as natural disasters and social problems such as food and medical safety have increased 16.2 percent from this year’s budget to 640.7 billion won. The government plans to spend 342.5 trillion won ($305.6 billion) in 2013, an increase of 5.3 percent compared to the previous year, with the aim of boosting the sagging economy while maintaining fiscal health. The Finance Ministry announced on Tuesday the final budget proposal to be presented to the National Assembly for approval. According to the budget plan, the government will designate 10.8 trillion won to create about 600,000 jobs in consideration of a lack of jobs for youth and baby boomers. 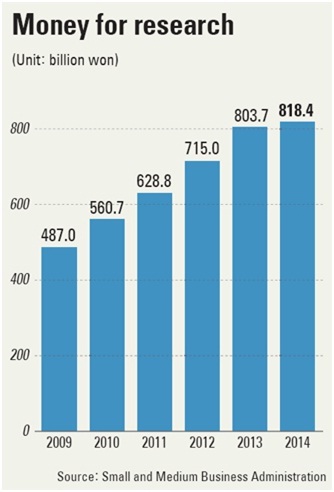 The government allocated 97.1 trillion won for health, welfare and labor affairs, up 4.8 percent from this year. In an effort to enhance the nation’s growth potential, the spending plan calls for 16.9 trillion won (5% of its budget) to be used on research and development. For full article see Korea Herald. South Korea’s eight government ministries and departments asked for more than six percent increase in research and development (R&D) budgets from last year. The budget requests submitted by each relevant government department added up to 17.2 trillion won ($15.1 billion), up 6.2 percent from this year, said the National Science & Technology Council (NSTC) Sunday. The NSTC is in charge of distributing all scientific R&D funding that is not related to national security and social/humanities research. 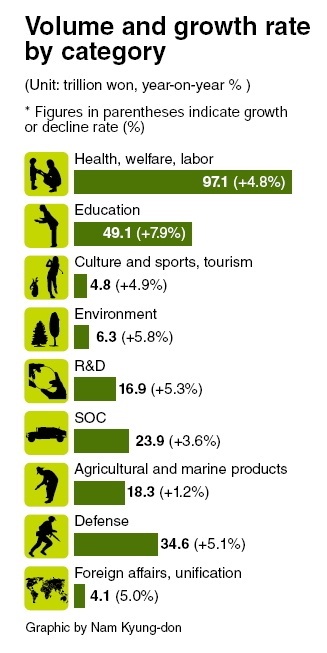 The budget request for the international science business belt project increased 41 percent to 310.0 billion won. The R&D budget request for SMBs rose 7.6 percent to 763.7 billion won, while R&D support for startup SMBs rose 73.8 percent to 128.6 billion won. 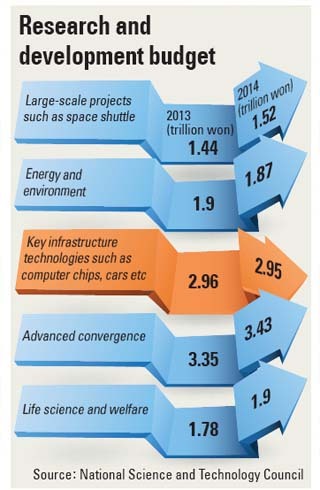 The budget request for convergence technologies was expanded 89.2 percent to 75.5 billion won. For full article see Maeil Business.